Wednesday, May 15, 2019 - Thursday, May 16, 2019 at Wood Basic Science Building Auditorium. This event is full. Now accepting wait list registrations. This workshop provides information and tools on the many aspects of managing and maintaining readiness of a facility and public health partners responsible for monitoring, assessing, and/or treating patients with Ebola and other special pathogens. This workshop is beneficial to both healthcare workers and public health professionals. Hospital attendees may include, but are not limited to, medical, laboratory and/or nursing staff, administration, education/training leadership, and infection control leadership. Clinicians focused on special populations, such as Pediatrics and Labor and Delivery, can also benefit from this workshop. Attendees will have the opportunity to select from one of three tracks to attend during the workshop. EMS/Prehospital: Targeted for EMTs, paramedics, and first responders. 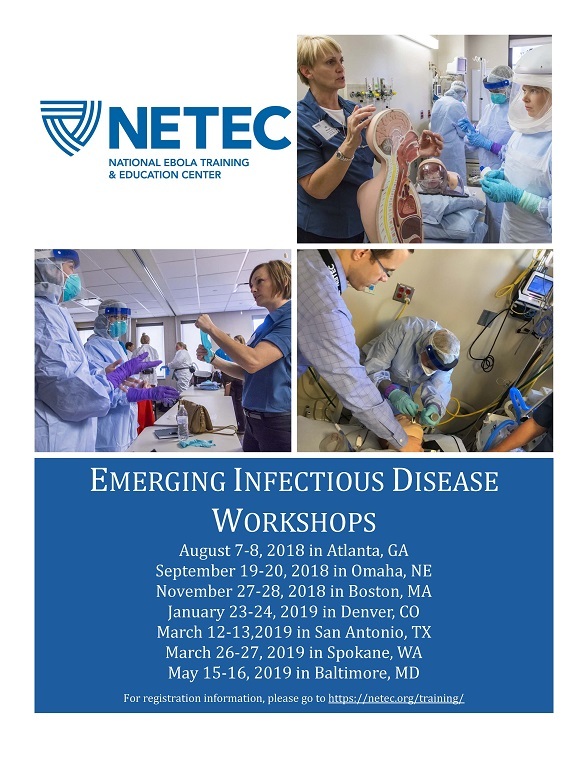 This is an operational course in infectious pathogens and the use of appropriate PPE, vehicle preparation and decontamination, transportation concerns, and patient hand-off. Leadership: For clinical and operational decision makers, emergency managers, nursing and healthcare leadership. Topics include incident management, exercise planning and execution, public health concerns and concepts, and preparation of the team and facilities. Day 1 will end with leaders and clinicians coming together to learn about special population concerns when caring for pediatrics, OB, L&D, and agitated patients in biocontainment units. *Clinician: For the clinical staff, including laboratorians, required to wear PPE. Didactic sessions for nurse and lab clinicians will focus on different elements of PPE including donning and doffing protocols, the role of the trained observer, critical thinking when providing patient care, and special population concerns when caring for pediatrics, OB, L&D, and delirious or agitated patients. Clinical skills topics will vary by workshop location and may include: specimen collection, peripheral IV insertion, urinary catheter placement, containment wrap or patient isolation unit for transport, spills management, and care of the deceased. *Laboratorians in the Clinician track will have the option to attend a specialized session: Laboratory Theory and Practice. Participants selecting the Clinicians track or the optional Day 2 session: Laboratory Theory and Practice will be asked to bring their facility's full PAPR “wet” level or equivalent PPE. Each attendee will be wearing full PPE for 2 – 4 hours each day. This activity has been planned and implemented in accordance with the accreditation requirements and policies of the Accreditation Council for Continuing Medical Education (ACCME) through the joint providership of the University of Nebraska Medical Center, Center for Continuing Education and NETEC. The University of Nebraska Medical Center, Center for Continuing Education designates this live activity for a maximum of 12.25 AMA PRA Category 1 Credits™. Physicians should claim only the credit commensurate with the extent of their participation in the activity. Emory Nursing Professional Development Center (ENPDC) is accredited as a provider of continuing nursing education by the American Nurses Credentialing Center's Commission on Accreditation. Attendees to this CNE activity will be awarded up to 12.25 contact hours by ENPDC. No conflict of interest has been found with the speaker for this CNE activity nor with the members of the planning committee. NETEC is approved as a provider of continuing education programs in the clinical laboratory sciences by the ASCLS P.A.C.E. ® Program. P.A.C.E. CE contact hours satisfy continuing education requirements for federal regulations, state licensure, certification agencies and employers. Attendees completing the workshop will be awarded 8 contact hours for day one and 4 contact hours for day two through P.A.C.E. Contact hours will be awarded upon workshop and evaluation completion. The University of Nebraska Medical Center, Center for Continuing Education, EMS and Trauma Division approves this educational opportunity for 12.25 hours of Emergency Medical Services Continuing Education.